Members of the Rotary Club of Cranleigh had a busy and successful festive season, raising well over £1,600 for Rotary charities. The festivities got off to a tuneful start when students from St Cuthbert Mayne Junior School and musicians from the Cranleigh Youth Bands entertained an audience of parents and visitors during the Rotary Club of Cranleigh’s Annual Carol Concert. The compere for the evening was Dr Claire Potter, the recently arrived Methodist Priest in Charge, who gave a new slant on the Nativity Story by asking the audience and children to add various sound effects. The Rotary Club agrreed to boost the retiring collection, which was donated to the local Food Bnak, to the sum of £250. The Rotary Club of Cranleigh’s three-day street collection (accompanied by Father Christmas) raised a further £1,643. 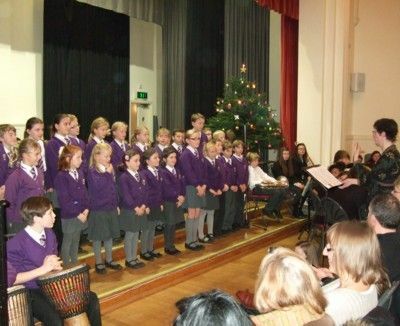 Photo caption: The choir from St Cuthbert Mayne School singing at the Rotary Club of Cranleigh’s Annual Carol Concert.